It’s hard to believe that it’s already been a few weeks since Stagecoach Country Music Festival has come and gone…now that the dust has settled and we’ve fully recouped, here is our “Stagecoach Dump” of the biggest weekend in Country music. Country’s answer to the storied indie-rock desert ‘fest Coachella, did us good this year with the acts they chose. …Dierks Bentley, Shania Twain and Kenny Chesney as headliners ….with additional performances by Cole Swindell, Brett Eldredge, Thomas Rhett, Randy Houser, Kip Moore, Tyler Farr, Jerry Lee Lewis, Willie Nelson and Family, Travis Tritt, Jon Pardi, Maren Morris, Maddie & Tae, Dan + Shay, CAM, Los Lobos, Jamey Johnson and MANY more…. Added bonus performances by Honey County & Tegan Marie also a highlight of the weekend….along with all those performing their inaugural Stagecoach…Ryan Hurd, Dylan Scott, William Michael Morgan, Elle King & Anderson East to name a few. What happened to Cyndi Lauper? She disappeared from the lineup with no explanation…. Set aside the rules and regulations and placing your main focus on the music, this venue the perfect place to host the best artists in country music. The experience as a whole is a truly positive one… and I’m really not complaining about the fact that I had to share the venue (mostly the bathrooms and beer lines) with 90k other country music fans or the fact that we had to walk miles in and out of the venue. The young men who deemed it necessary to wear denim overalls that were too tight & too short with nothing underneath…this was very bad, I tried to snap a picture but chickened out. Friday night was the men’s night at Stagecoach…Dierks Bentley pretty much brought his whole tour to the desert…Jon Pardi (who’s more of a “ragecoach” kind of guy), Cole Swindell and Dierks himself were the perfect way to kick of the weekend festivities. Saturday night on the Palomino Stage…Willie Nelson performing on his 84th birthday along with his family, his sister on the piano, his brother on the drums and his very handsome song singing along side him. He may be in his 80’s but the man has still got it…this is one performance/experience that will go down in the history books for me. Why he was on the side stage and not the Mane stage is always a wonder to me. Sunday…CAM…enough said. The California country girl came out on stage to the Beach Boys “Wish They All Could Be California Girls” followed by one hit after the other…”May Day”, “Runaway Train”, “Cold In California”, “The Village”, “Country Ain’t Ever Been Pretty” and a cover of the Mamas and Papas “California Dreamin'”. She dedicated her set to all the people in the back who came out to see her two years ago and was so good to see people in the front of the stage this year! Ending with “Burning House” that’s exactly what she did…burned down the house at Stagecoach. hopefully next time she’s back it will be in the headlining spot. 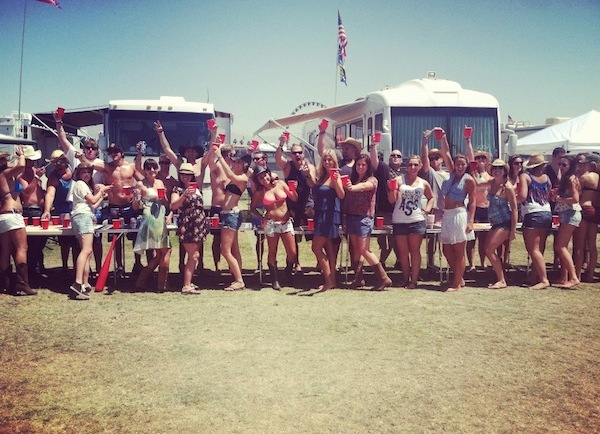 There is always and adventure to be had at Stagecoach and that’s what makes it the most memorable. Can’t wait for 2018…who do you hope will be on the lineup? Can we PLEASE get Kid Rock out here at some point?!? For more information on Stagecoach visit their website at www.stagecoachfestival.com. Granger Smith’s New Single “Happens Like That” Available Now!